Extra! Extra! Read The New York Times Digital Edition Through the Library! San Francisco Chronicle Online Available at the Library! Celebrate the Splendor of Unicorns! San Mateo County Libraries Go Fine-Free! Just in time for Money Smart Weekopens a new window (March 30-April 6), San Mateo County Libraries now offers Financial Ratings Series Online by Weiss Ratings and Greyhouse Publishing for our community. Complimenting Morningstar Investment Research Center, Financial Ratings Series Online provides independent information to help consumers make informed decisions about their finances including insurance, Medicare, banking, and investment options. Financial Ratings Series Online uses the trusted Weiss Ratingsopens a new window letter grades to evaluate financial entities. 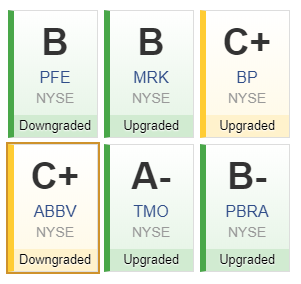 These letter grades are supplemented with clear and detailed information that both finance novices and seasoned investors can follow. Banks and Thrifts: Search for every bank regulated by the Federal Reserve. Credit Unions: Find ratings for every Credit Union in the US. Insurers: Look up health insurers, property and casualty insurers, and life and annuity insurers. Mutual Funds/ ETF’s: Research stock and fixed income funds as well as exchange-traded funds. Stocks: Find ratings on every stock on the NYSE, NASDAQ, and NYSE MKT. You can receive a personalized report on Medicare Supplement Insurance options! On the Financial Ratings site, navigate to the Medigap tabopens a new window. Then, simply enter your age, gender, and zip code to receive your own personalized Medicare Supplement Insurance Buyers Guide. This resource can help you find out which Medicare supplement insurance plan is right for you and compare rates between different insurers. Does finance make you feel fuzzy? That’s okay! The Financial Literacy Toolsopens a new window cover a wide range of money-related topics such as starting a 401k, managing debt, making and sticking to a budget, etc. This is also a great resource for teens and college students! To start exploring these new financial tools and resources, simply navigate to Financial Rating Series Online via San Mateo County Libraries' website. You can create an account with your email address to build watchlists for stocks and companies, customizable search criteria, email updates and more. If you would like to learn even more, check out our online tutorialopens a new window on how to get the most out of the Financial Ratings Series Online. Money Smart Week is held annually, this year from March 30 to April 6, 2019, with the mission to help consumers better manage their personal finances. In addition to the new Financial Ratings Series Online, San Mateo County Libraries offers many other financial literacy resources. Morningstar is a respected tool for collecting financial information, obtaining portfolio analysis, learning about investment options, and reading financial news commentary. All you need is your library card to get access to data on over 14,500 stocks. Kick off Money Smart Week by trying Morningstar's 30 Days to Financial Fitness. San Mateo County Libraries also offers financial literacy programs year-round, from tax preparation to financial gaming for teens and tweens. Check out what's coming to your community branch on our calendar. What’s your financial goal for this spring? Share with us in the comments.